On a hot July day in 2009, SWET’s Summer Party featured a kaiseki lunch at the Kantokutei restaurant in Tokyo’s Koishikawa Kōrakuen garden and a talk by Sumiko Enbutsu. Author of Discover Shitamachi: A Walking Guide to the Other Tokyo (1984), Water Walks in the Suburbs of Tokyo (2000), A Flower Lover’s Guide to Tokyo (Kodansha International, 2007), and other walking guides to Tokyo and surrounding areas, Enbutsu spoke about the making of her books and some of the activities and research projects in which she has been involved. The following is a condensed and edited transcript of her talk. Koishikawa Korakuen, a precious gem of Tokyo and one of the oldest existing daimyo gardens in the city, is a fitting place to gather and talk about Japanese culture. The daimyo, who were expected to reside alternately in Edo and the domains to which they had been assigned, were granted large tracts of land for their residences. Many of these estates included extensive stroll gardens that were landscaped to please the owner-lords and their guests, and their guests were all educated in classical, Confucian-based learning. Some of the gardens’ features were designed to provide something like a “virtual excursion” to famous sights elsewhere in Japan. There would be miniature scenes of Mount Fuji or Lake Biwa, for example, or the hillsides at Arashiyama in Kyoto. Well-known scenes and motifs inspired by Chinese literature and thought were important as well. At Koishikawa Kōrakuen, we see an example right behind the Kantokutei pavilion—a miniature of the straight dike that runs through West Lake (Xi Hu) in Hangzhou, southern China. A little beyond is a small arched stone bridge that was designed by a Chinese scholar whose patron was the owner-lord of the garden. In the course of the changes after the Tokugawa shogunate came to an end and a new government came to power under Emperor Meiji in 1868, the daimyo lords returned their large landholdings to the emperor (in other words, to the government). The Meiji government conveniently used these spacious parcels of land for various industrialization and modernization projects. Koishikawa Kōrakuen garden was once part of the large estate of the lord of the Mito domain in this area. The residential section of the original estate on the east side was completely demolished to become the site of the Tokyo Hohei Kōsho, a munitions plant for the imperial army of Japan. The garden, too, would have been destroyed if it had not been for the intervention of the then minister of the army, Yamagata Aritomo (1838–1922). Yamagata was a great lover of traditional gardens, and he ordered that this garden be preserved and carefully maintained. That was in 1870, only two years after the Meiji Restoration. On the eastern edge of the garden there is a stone monument commemorating the site of the munitions factory. A short distance away, in the corner of the pine grove beyond the large pond, is a relic of a bullet-making machine. The munitions factory was severely damaged in the Great Kanto Earthquake in 1923, and the site was sold to the private sector. In the 1930s, when a developer set out to build Japan’s first baseball stadium there, it could not remove the factory’s all-too-sturdy underground foundations, which went five meters into the ground. Only in the late 1990s, when the site was redeveloped for the new Tokyo Dome Hotel designed by Tange Kenzō, were the cemented bricks of that early foundation finally removed. A block of the excavated foundation is on display behind the big hotel. Order from Amazon.jp via SWET link here. The Koishikawa Korakuen garden provides excellent examples of some of the points I wanted to raise in my book A Flower Lover’s Guide to Tokyo. Various features around the garden evoke images from classical poetry or literature that have become well-known motifs in works of art and craft, for example in chiyogami woodblock-printed paper. One of these features is a wooden bridge made up of planks set at angles in eight sections that was installed in the seventeenth century. The design of this yatsuhashi (lit., eight bridges), usually translated “zigzag bridge,” was inspired by a tenth-century waka in The Tales of Ise. The five lines of the verse begin with the syllables of the five-syllable name of the purple iris, kakitsubata. This technique, called oriku, is often used as a kind of intellectual game among poets. There is a three-syllable oriku for haiku, and a five-syllable oriku for waka. Praised for its clever improvisation this poem helped establish the association of irises with the zigzag plank bridge, as well as the name of the place where the poem was composed: Yatsuhashi, in what is now Aichi prefecture. 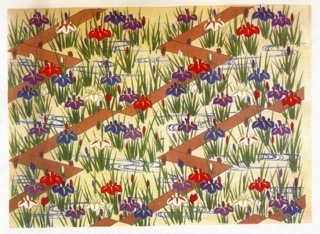 Zigzag bridges with iris shown in a chiyogami print owned by Kikujudō Isetatsu. The chiyogami printed from blocks in the collection owned by the Isetatsu paper shop in Yanaka is titled “Yatsuhashi,” and we can see other examples of this motif on lacquerware and textiles. There are also two famous painted screens inspired by the kakitsubata iris—one in the collection of the Nezu Museum in Tokyo, and the other at the Metropolitan Museum in New York, both created by Edo-period artist Ogata Kōrin (1658–1716). The latter juxtaposes irises against a zigzag bridge, and when you visit ornamental iris gardens today, you will often see such a zigzag boardwalk. It is amazing how far-reaching the influence of this one poem has been, penetrating widely into Japanese culture, adorning even children’s playthings—which is what people have long considered chiyogami to be. The hero in The Tales of Ise is modeled after the historic poet Ariwara no Narihira. Another of his poems, composed in admiration of the crimson red maple leaves scattered over the Tatsuta River in Nara, immortalized the association of maple with the Tatsuta River, and influenced paintings and decorative motifs in subsequent centuries. We see the maple leaf motif applied to textiles and pottery. A bowl by potter Ogata Kenzan (1663–1773), younger brother of Korin, is titled “Tatsuta-gawa”; a chiyogami in the Isetatsu collection has the same title. The maple’s association with the Tatsuta River was later extended to the Ōi River that flows through the beautiful Arashiyama area of Kyoto. A scene reminiscent of these images is what we see in the western section of the Kōrakuen garden. 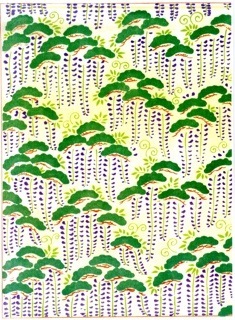 Wisteria with pine boughs as shown in a chiyogami print owned by Kikujudō Isetatsu. I knew about Isetatsu and its products better than many other people, and I began to learn more about the rich literary associations hidden in chiyogami designs. About six or seven years ago, when I was looking for some nice visuals for my next guidebook about flower walks, which I initially planned to publish on my own, I couldn’t afford photographs taken by the requisite professional. I had been searching in libraries, university archives, and park management offices for drawings or botanical sketches when I realized that some chiyogami feature flowers with literary associations. I went to Isetatsu and began going through their old collections of woodblock samples. I ended up finding excellent examples, some of which we eventually used for the chapter-title spreads in A Flower Lover’s Guide. The chiyogami here, though different from the one we used in the book, reflects the Heian love of wisteria, a flower that aristocrats felt was best admired when its blooms cascade from the boughs of a pine tree. Sei Shonagon, author of Makura no sōshi (The Pillow Book), praises the beauty of long clusters of wisteria hanging from pine branches. In The Tale of Genji, Lady Murasaki describes a romantic evening scene in which the hero stops his carriage to take in the view of wisteria flowers gently swinging from a pine tree in the moonlight. Among the treasures that belonged to the Reizei, a family that has preserved Japan’s ancient literary traditions to this day, is a pair of painted screens with 12 scenes altogether for the 12 months of the year. Each scene, or panel, depicts a representative literary association for that month. The scene for April features men in a shinden-zukuri-style residence enjoying the blooming wisteria. The wisteria flowers are hanging from an ancient pine tree. The wisteria chiyogami echoes this Heian taste. 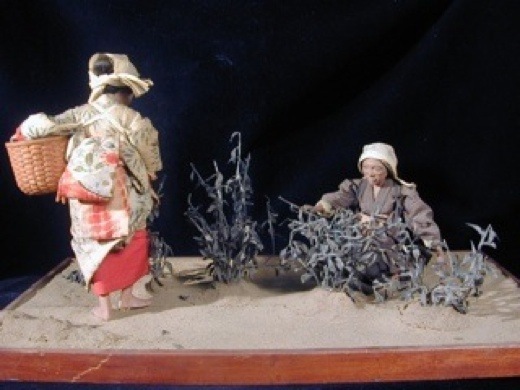 Tachibina, the old-style hina dolls, are also customarily attired in costumes featuring pine-and-wisteria patterns. 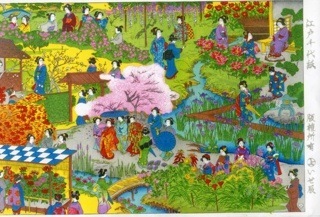 “Hyakkaen,” a chiyogami print owned by Kikujudō Isetatsu, showing women enjoying seasonal flowers. At Isetatsu, I found not only fine designs of cherry blossoms, plum blossoms, bush clover, chrysanthemum, and pine, but also a lovely piece entitled “Hyakkaen,” which shows 13 of the 15 classes of flowers I had in mind for the book. The groups of women shown on outings to see the seasonal flowers are reminiscent of similar renditions in the Edo meisho zue (Famous Sights of Edo)—here we see women sallying forth to see the azaleas in Okubo, or to see the cherry blossoms on the banks of the Sumida river. The people at Isetatsu were always friendly, and I had had no problem getting permission to use their chiyogami in my articles in the Japan Times column “Flower Walks.” Originally meant for children and women, chiyogami were once part of popular culture. Available at very low cost, the paper was used to cover boxes, toys, and whatnot to beautify articles of daily use. Until a decade or two ago, these traditional woodblock-printed papers were regarded as cheap goods, and no one fussed about the proprietary rights to the designs. Today, however, there is much ado over these rights. Isetatsu later hesitated to give permission for me to use some of their pieces when I eventually got the cooperation of Kodansha International to publish A Flower Lover’s Guide to Tokyo. Kodansha’s editors and designers liked the idea of using chiyogami prints along with photographs. In the late 1970s, I was a member of an international women’s group called the Tokyo Theatre for Children. Many friends I got to know through this group complained about how confusing the city of Tokyo was. One day, a friend asked, “What is shitamachi?” She had heard Edward Seidensticker talk about the eastern part of Tokyo, which is rich in history (he was then preparing his book High City, Low City). I couldn’t answer right away, so I just took some friends to Yanaka. I showed them the crowded housing, with rows of nagaya along narrow lanes lined with potted flowers, and so forth. That is my image of shitamachi. I still don’t have a good English term for nagaya, those old-style wooden houses with several dwellings under one roof. It was a quiet weekday, and in those days, people had an image of Yanaka as a gloomy, damp graveyard—nothing exciting at all. My friends looked puzzled and a bit disappointed, asking, “This is shitamachi?” I realized that this area needed a lot of explanation—such as the traditions of kabuki and ukiyo-e, which were developed by and for people who lived modest lives in places like Yanaka. I needed to tell them about people like the shokunin—craftsmen—who had their workshops in their nagaya homes, competing with other artisans to hone their skills but bound together by a strong sense of community. Another friend also told me of her difficulties trying to get to know Tokyo. She would go out by herself, quickly get lost, go home, and try again. After many trials, when she was finally confident that she could get around alone, she said that she felt as though she had conquered something. But by then, it was time for her to leave Japan, as her husband’s assignment was over. I was very sorry to hear this. I tried walking around, pretending to myself that I could not read or speak Japanese. Assuming that I was unable to read signs or ask anyone for directions, I could understand my friend’s feeling of being enclosed by high walls. Other friends wanted to know about the wooden sticks standing in the backs of gravestones in temple cemeteries. They were puzzled about the way jizō images were always alone or in groups of six: Why half a dozen for jizō statues, but not for the sets of cups and bowls we want to buy? I tried to provide honest answers as best I could, and made copies of my writings and maps so that friends could use them. They liked my explanations and maps—with the copies they could give friends walking tours, too, and feel like expert guides. Many of them urged me to compile my notes in the form of a book and publish it. 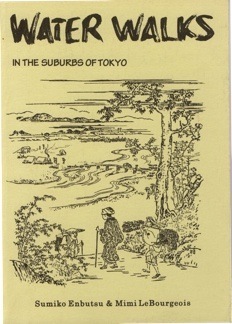 This led to my first publishing venture: getting Discover Shitamachi: A Walking Guide to the Other Tokyo (Shitamachi Times, Inc., 1986) into print. When preparing this and my subsequent books, I always tried to combine four elements—a good walk, good stories, good visuals, and good recommendations for tea or lunch en route. It is not easy to satisfy all four elements; I may compromise on the visuals or the restaurants, and sometimes the story might be so-so, but I always insist on good walks. To make sure that anyone with a reasonable sense of direction can get to the destination, I put a lot of time and thought into selecting the destination, walking the route, and making sure that the landmarks are easy for non-Japanese to identify. I have my manuscript tested in the field at least twice, and by a different person each time. Maps are important, too. They should be clear and should mesh with the text. I adopted these basic guidelines for writing my book from the beginning. I was totally ignorant of the market for my little book, and I couldn’t find a publisher. 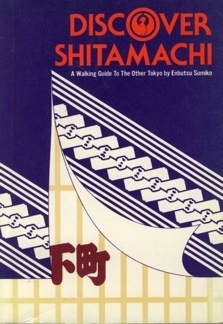 In the 1970s, walking wasn’t “in” yet, and no one thought shitamachi deserved a whole book in English. Some editors criticized the elaborate walking directions in my manuscript, and some didn’t like the hodgepodge of miscellaneous information. They told me that information on history, restaurants, museums, festivals, and handicrafts should be categorized—“Don’t jumble them up!” they said—but that made me think that book editors are not walkers. A good walk is inherently a jumble! I was determined to do my book the way my friends liked it. Eventually, I joined forces with a down-to-earth Japanese tabloid publisher that specialized in shitamachi but had no experience with books in English. Both the publisher and I put money into this project. I was in charge of producing the book, and the publisher handled the marketing. The publisher also found a photographer and illustrator for me, and I found a printer experienced in handling English. Many friends helped me with editing and proofing galleys. I did the page layouts myself. I had no idea how tough it was going to be! When Discover Shitamachi came out, my publisher did a good job advertising the book in the four major newspapers in Tokyo. The first printing of 3,000 copies sold out in a month to Japanese readers. With the proceeds, we went on to the second printing, which took two years to sell. Sales slowed to a trickle, but I was getting positive signs that the book was attracting foreign readers. So I proposed a third printing. My publisher was reluctant, but agreed on the condition that I put up the money. It was a tough project indeed, and I finally decided I had had enough of it and would go on to other things. Altogether we sold 9,000 copies and the book is now circulating in the second-hand book market. Tired from publishing the Discover Shitamachi, I decided that I would rather just enjoy walks with friends, and we began exploring Chichibu—the festivals and pilgrimages to temples. Chichibu is a wonderful destination for hikers and festivalgoers. It is also a paradise for naturalists and anthropologists. Judy Forrest, one of my regular fellow walkers, told me one day about a new book by Haru Reischauer, Samurai and Silk: A Japanese and American Heritage (Harvard University Press, 1986). Mrs. Reischauer wrote about her grandfathers in the Meiji era. Her grandfather on her mother’s side was a silk merchant; on her father’s side, her grandfather was a samurai who served as finance minister and then prime minister when the national government was trying to establish itself in the 1880s. But there is another side to the story, I told Judy, the side of the people outside of the centers of power. That was also the time of the rebellion launched in 1884 by silk farmers in Chichibu in protest of the land tax and deflationary policies. Judy was immediately curious about the uprising, and we promptly put together a group for a weekend walking adventure to recall that history. We started at Kibune-jinja, a small Shinto shrine in the northwestern corner of Chichibu, where the Meiji-era farmers had gathered for a rally and then marched on foot to attack administrative offices in the district center, now the city of Chichibu. The photographer for Discover Shitamachi came with us. It happened to be a festival day at the shrine, so villagers were performing the kagura. They were excited to have us there, as we were their only audience. From the shrine, we followed the route the protesting farmers had taken, walking along rice paddies ready for harvest and wading across the shallows of a river. Along the way, I explained the economic and social background of the incident. Al Seligman, a retired American diplomat in our group, remembered a parallel in American history. In the 1790s, America was experiencing the birth pains of a new nation. To pay back the debts incurred by the revolution and war, the government levied an excise tax on all distilled spirits. Small producers in western Pennsylvania resisted the new tax, which was only payable in cash, and started the Whiskey Rebellion in 1794. The rebellion was put down after George Washington called in the militia, and according to Seligman, the rebel leader fled to New Orleans. The Chichibu rebellion of Japan, likewise, was put down by the new government army, but one of the leaders narrowly escaped its grasp and fled to Hokkaido, where he lived out his days. We were all fascinated by this similarity between two historic incidents a century apart and on opposite sides of the Pacific Ocean. History repeats itself, indeed. 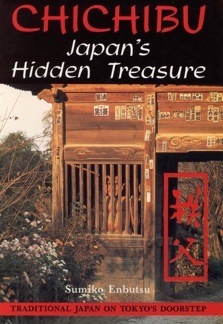 This excursion prompted me to consider my second book, Chichibu: Japan’s Hidden Treasure—it seemed to me that this rural area deserved more international recognition. I took up the challenge, knowing that it was going to be tough. My Chichibu friends were excited and promised their wholehearted cooperation—a photographer made his beautiful photographs available for free, and an artist offered charming woodblock prints. An American friend introduced me to a publisher in Tokyo. The publisher was more interested in doing a different version of my shitamachi guide, but agreed to do the Chichibu book first, on the condition that someone would underwrite half of the first edition. It happened that the mayor of Chichibu was planning an international children’s festival using the windfall money given out to all municipalities by Prime Minister Takeshita Noboru (furusato sōsei ichiokuen jigyō) in 1988. I thought Chichibu guide in English would be a perfect tool to promote his plan. I visited the mayor and key members of the city assembly to solicit their support. In return, Judy and I helped organize the first and biggest international event in the area in 1990, naming it “Children’s Kingdom in Chichibu.” The festival was a huge success, and the book was published. It is a walking guide, so as always, I walked all over the area to confirm details and had my manuscript tested in the field many times. I was very happy that I could publish these two books in a style I believed in. 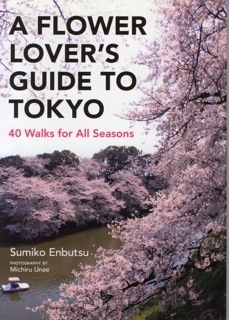 The best rewards for me are my readers’ favorable comments—to hear people say that they enjoyed walking Tokyo’s back streets or exploring the countryside after reading these guides. But the market is cruel to this type of book, which is basically for local use only. So when my fellow volunteers in the Sumida River Environmental Group asked me to do a book in English, I had to discourage them. 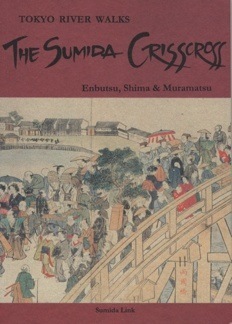 When they wanted to do a book as part of the tenth anniversary program for the group, I warned them repeatedly that it wouldn’t be a good idea, but was persuaded to say yes, after all, and we did eventually publish The Sumida Crisscross. The Sumida Crisscross has a rather original format—a large, foldout map with walking instructions that come out at the side, with explanations given on the pages that follow. The maps are real works of art, provided by a member of our group, Muramatsu Akira—who is a professional map artist. We were very proud of this book, but we couldn’t place it in bookstores. So we sold it mainly by word of mouth, mostly among Japanese. Ten years or so passed, and this also has gradually become known among non-Japanese on the secondhand book market. During the extensive research I did for The Sumida Crisscross, I learned about the ambitious river-engineering projects undertaken by the generations of Tokugawa shoguns, started even before Tokugawa Ieyasu became the shogun. The city of Edo could not have grown successfully without reorganizing almost all of the rivers in the entire Kanto region and building canal networks to supply drinking water to the one million citizens of the city. What I learned inspired me to do Water Walks in the Suburbs of Tokyo. For the maximum convenience of walkers, I designed this book as a collection of annotated maps. The maps are foldouts; they can also be detached and put in a plastic case, rolled up, and put in your pocket or in your bag. For Water Walks, I was lucky to have Edo meisho zue as a source of illustrations. Edo meisho zue is a guidebook published in the nineteenth century featuring several hundred sketches of places and people in Edo. I could use as many of these as I wanted. Water Walks was self-published because I knew that no regular publisher would be interested, given the book’s unusual format. My old friend Mimi LeBourgeois worked closely with me on the Water Walks project. We took it to a small printing shop in Yanaka to be produced cheaply, and paid the cost ourselves. This book is still available at two stores in Tokyo—Good Day Books in Ebisu, and Blue and White in Azabu Juban (run by Amy Katoh). It has been a slow but sturdy seller, and is recommended on various websites. Unfortunately, I don’t think The Sumida Crisscross is available anywhere. There have been many spin-offs from my books; Discover Shitamachi changed my life. I got to know many people, both residents of Japan and frequent visitors, as friends. I also got to know the Japanese women’s group based in the Yanaka area that publishes the quarterly magazine called Yanesen. The activities of this group were recently reported on at some length in an NHK television program. Yanesen is a quarterly in Japanese inaugurated in 1984. They did three issues in English, but it was difficult to sustain because they didn’t sell very well. Yanesen has continued for 25 years now, and it has contributed greatly to revitalizing a formerly somewhat forgotten, sleepy area of old Tokyo. The name of the magazine is taken from the first part of the names of the Yanaka, Nezu, and Sendagi neighborhoods. It has often reported on situations in which excessive development adversely affects people’s lives, and the magazine’s office became a center for volunteer groups interested in environmental and architectural preservation issues. The women’s group started their magazine in October of the same year my Discover Shitamachi came out (April), and we immediately became good friends and did a lot of things together. One of the big projects we worked on together was the “Save Shinobazu Pond” campaign. In 1989, we were shocked to learn about a horrible plan to dig up the lotus pond in Ueno just down the hill from Ueno Park and put a huge car park underneath it. After reading the scoop on this plan by a journalist for one of Japan’s national newspapers, we launched a movement to stop it. We worked very hard collecting signatures, both from Japanese and non-Japanese, for a petition to submit to the Tokyo metropolitan assembly. We organized many events, such as a symposium to review the proposed project from many perspectives, focusing on the history, city planning, geology, and economic assessment aspects of the public project. We invited speakers whose expertise lay in these areas. One of the benefits cited by proponents of the project was supposedly to enhance the international image of Ueno. So I invited Mr. Jonathan Holliman, one of the founders of Friends of the Earth who was working with the United Nations Development Programme in Aoyama at the time, to serve as keynote speaker. To help people understand the issue, I rapidly translated the summaries of the Japanese speakers’ talks and made a little booklet. Holliman and my ex-pat friends all spoke eloquently, declaring an unequivocal “no” to the vaunted “international enhancement” notion of the project, and it was all recorded on television. The symposium received air time on NHK TV and in the major newspapers, greatly strengthening our voice against the project. We hung on with the opposition movement for ten years, pushing the proponents over and over to cancel or relocate the project. Finally, when the Taito municipal assembly adopted a plan to build a much smaller car park 200 meters away from the pond, we found it difficult to keep resisting as we were exhausted by then. The new car park was completed in April this year, underneath the Ginza subway line, but is little used. Its extremely difficult construction, owing to owing to still-flowing underground streams, resulted in skyrocketing costs. Some of our members residing in Taito Ward have filed procedures for an official audit report. So far, no harmful influence on Shinobazu Pond has been noticed. Another big project that I have been involved in is the preservation of the Yasuda House in Sendagi. This is a beautiful 90-year-old wooden house, formerly the residence of a member of the Yasuda zaibatsu, which escaped destruction in both the Great Kanto Earthquake of 1923 and the bombing of Tokyo in 1944–1945. Fourteen years ago, when the owner of the house, Yasuda Kusuo (1903–1995), died, the house was threatened by a huge inheritance tax. 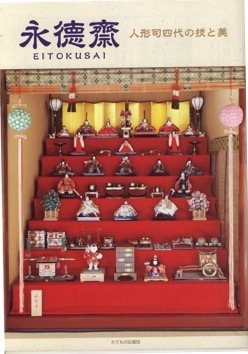 Those of us connected with Yanesen magazine helped Mrs. Yasuda save the house by arranging for her to donate it to the Japan National Trust. We continue to be involved in the maintenance of the house, which is open to the public twice a week. Volunteers guide visitors on house tours, and it is a splendid example of traditional Japanese architecture, so I encourage you to visit. We also organize various events to raise funds for the house, to be used for maintenance and further restoration. The Yasuda House work got me started on another intriguing project when I saw the beautiful dolls that were made for display in its large tokonoma and that had been donated to the Japan National Trust, along with the house. The dolls are on display every year in March and May. 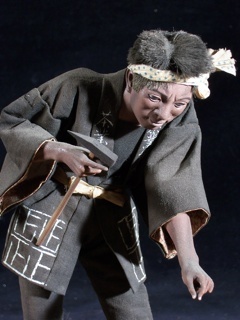 Fine antique dolls are rare collector’s items that open a window on one of Japan’s proud traditions of craftsmanship. My fascination with Eitokusai III, whose given name is Yamakawa Yasujirô, deepened when I learned that he had traveled to the United States 100 years ago and lived in Philadelphia for 20 years! Just imagine! A real Edokko, born and raised in Nihonbashi, going off to the wilds of America in 1907, despite all the difficulties that travel must have involved in those days. Nothing seemed to be known about him and records were virtually non-existent, but I started looking for clues with just a wisp of an idea six years ago, and I have been rewarded by a long chain of serendipitous discoveries. I learned that Yamakawa had lived and worked in Philadelphia between 1907 and 1927. He had traveled first to St. Louis to assist with the Japan Tea Industry Cooperatives exhibit at the World’s Fair there in 1904, and then made a second trip to Philadelphia, where he worked for the Commercial Museum. When he returned to Tokyo in 1927, he slipped back into traditional doll-making, seemed to have no trouble at all meeting the exacting demands of his connoisseur customers, and left a legacy of splendid dolls. The Commercial Museum in Philadelphia has been largely forgotten, but I did discover that some human figures by Yamakawa made there have been preserved. What was he doing in Philadelphia? He was making life-size, lifelike models of all types of people worldwide, for displays in the museum. Old photos show examples such as a figure of a Mandarin scholar seated at a desk writing with a brush and a Belgian woman separating seeds from the stems of flax. He made them using the traditional techniques of Japanese doll-making he had mastered back in Tokyo. He made the head and hands, and the bodies were basically sticks of wood padded with cotton or straw that were dressed in real costumes from the museum’s collection. Scenes illustrating Japanese tea-making processes made by Yamakawa Yasujirō for the Commercial Museum in Philadelphia. Photographs courtesy of the Temple University Anthropology Laboratory. The museum he worked for was the brainchild of a Pennsylvania University professor, Dr. William P. Wilson. It was a time when the United States did not yet have a department of commerce. The manufacturing industry was growing at a rapid pace, and businesses were eager to sell their excess production abroad. The Commercial Museum was conceived as a place that would help manufacturers understand other countries and learn how to export their goods overseas. Wilson’s idea was to collect, from the numerous international expositions that were being held at the turn of the century, samples of raw materials, artifacts, and crafts that were put on display. The expositions lasted only three to six months, and when they were over, most of the things displayed were thrown away. Dr Wilson thought that if he could acquire them and put them on permanent display in a museum, they would help people learn about products and commodities from all over the world. For success in foreign markets, Americans needed to learn about the world beyond their horizons, and Japanese craftsman Yamakawa contributed to a museum that was indeed a success for many years. After Wilson died in 1927, the fortunes of the museum changed considerably, and the collection languished; the large models had little chance of surviving. Declared defunct in 1994, the museum and its history came to an end. What remained of the huge collection was dispersed in 2004 to other city museums and educational institutions. By sheer luck and coincidence, I found three of a set of four scenes Yamakawa had made to show the process of making and shipping tea in Japan. They were contained in cardboard boxes labeled “China” among the piles of things in a warehouse! My research on Yamakawa Yasujiro has continued, and quite recently (early 2010), after much detective work, I have found photographs of the doll maker in later life and additional information about him. Lastly, I would like to address a question that has come up frequently in the course of my work. Japan does have a National Trust, which is under the jurisdiction of the Ministry of Land, Infrastructure, Transport and Tourism, but it is managed by an independent foundation. The National Trust movement started in England over a hundred years ago, and they have many properties—over 200 historic buildings and 150 gardens—all popular destinations for tourists. The Japan National Trust, by contrast, was established in 1968, so last year, it celebrated its fortieth year. It has not been as active as the British, or for that matter American, National Trust movements. The Trust has been involved in some research and in archeological excavations, but it has only four properties at present. Two are open to the public—one is the Yasuda House, and the other is the Komai House in Kyoto, in the Kita-Shirakawa area. Two others are thatched-roof buildings in Shirakawa-go, the World Heritage site in Gifu prefecture, but they are not open throughout the year. Outside the National Trust, a good number of such historic properties are now maintained by municipalities—some by the metropolitan government and others by ward offices, using public funds. But Japan National Trust properties must depend on revenues from showing or using the properties, and donations. The Japan National Trust used to depend on corporate donors, and this was all right when the economy was good. But in this recession, companies are withdrawing their support or cutting back funding, so the Trust’s financial situation is very precarious. Individuals can join, and such memberships are a great help. The rooms of the Yasuda House in Sendagi can be rented, so organizations like SWET may wish to consider using them for group functions. The house is open to the public on Wednesdays and Saturdays, and can be opened to groups for a house tour or an event by reservation. Originally published in the SWET Newsletter, No. 124, pp. 20-38. Ed. note: This book was published in 1990 by Tuttle. Tuttle published a “revised edition” in 1999, but it was seriously flawed, with many mistakes and Enbutsu’s own revisions not included. Readers are encouraged to look for the original 1990 edition.